Czech car brand Skoda Auto today launched the Monte Carlo, a new edition of Rapid, priced at Rs 10.75 lakh (ex-showroom). 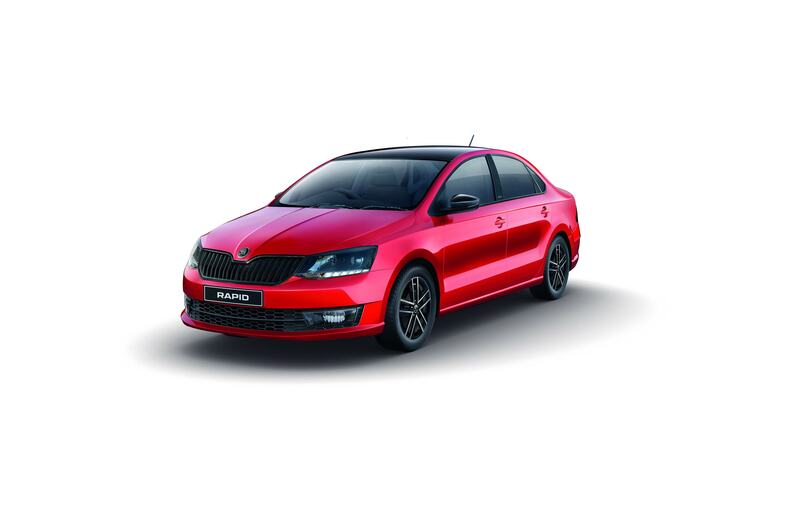 This new sedan is positioned as a sporty variant of the Rapid, the most affordable product in the Skoda India line-up. While the base variant is the 1.6 litre petrol the top-end version 1.5 diesel automatic costs Rs 13.57 lakh. Skoda has launched four variants of the Monte Carlo. At those prices the new Skoda car is unrivalled as the lower end of the Monte Carlo will compete against the middle variants of the Honda City and the to-be-launched Hyundai Verna. The City starts at Rs 8.46 lakh while the Verna is expected to cost around the same level. The Monte Carlo sports an all-black front grille, alloy wheels, black roof, black tailgate spoiler and black grained diffuser on the exterior. On the interiors the sedan gets a sporty flat bottom steering wheel, red and black leatherette Monte Carlo trademark seats, black interior decor, ribbed sporty stainless steel foot pedals and all black dashboard. It also gets a 6.5 inch, colour touchscreen central infotainment system with SmartLink technology that is compatible with MirrorLink, Apple CarPlay and Android Auto. Ashutosh Dixit, Director, Sales, Service & Marketing, Skoda Auto India, said, and “The new Monte Carlo is an integral part of our model offensive strategy in India. The Monte Carlo offers a compelling combination of the brand’s emotional design, exquisite interiors, and a host of convenience features, leading safety as well as intelligent connectivity features. The Monte Carlo is positioned at the top end of the segment”. The car gets engines borrowed from the Rapid. The 1.5 litre TDI that produces a peak power of 110PS (81kW) and a torque output of 250 Nm while delivering fuel efficiency of 21.72 kmpl (DSG) and 21.13 kmpl (manual transmission). The 1.6 litre MPI petrol engine with dual overhead camshaft (DOHC) 16 valves delivers 105 PS (77kW) of power and a peak torque output of 153Nm while delivering fuel efficiency figures of 15.41 kmpl (manual transmission) and 14.84 kmpl (automatic).